When she was commissioned, Kongo was the most advanced battlecruiser in the world. She was the first among battlecruisers and battleships to be equipped with 356 mm main battery guns. Unlike previous Japanese dreadnoughts, Kongo received a thinner armor belt while her deck armor and torpedo protection were reinforced. Kongo is considered to be one of the most enjoyable battleships in the game, especially towards the lower tiers. Kongo has by far the highest top speed of the battleships of Tier V, a strong, solid main armament of eight 14-inch guns in four twin turrets, far greater range than her contemporaries, good secondaries, and the most health of her tier. However, she's not the strongest in all suites - she's got the worst armor of her tier, with only 203mm of belt armour compared to New York’s, Texas’ and König’s 356mm belt armor, and she has the least guns of her tier. These shortcomings, however, don't stop Kongo from being one of the most competitive battleships in the game tier-for-tier. Kongo must always be careful with how she positions herself; showing too much broadside to an enemy battleship can be a fatal mistake. Kongo excels at both ranged combat and can use her maneuverability to outdo enemy battleships at closer ranges. Kongo is the second of three battlecruisers/fast battleships in the Japanese battleship line, coming after Myogi and eventually leading to Amagi at Tier VIII. Great gun range: Reaching out to 21+ kilometers, she has the second highest range in the mid tiers after Fuso. Impressive speed: Kongo can reach 30 knots, allowing her to keep up with cruisers and relocate if needed. Decent agility: She is surprisingly maneuverable and can cover her turning circle quite quickly. Good gun characteristics: her guns are accurate, powerful, and have decent penetration. Feels like a modern battleship in a world of outdated WWI era ships. Low AA suite potency: Her AA suite will not do much against higher tier aircraft. High detection range: She is easily seen at 16km, but not much of a problem, as she can fire out to 21 km. Battlecruiser armor: Her weak armor is easily penetrated by battleship shells, though it can be partially overcome with angling. Sluggish rudder shift time: It takes a long time for her to start turning compared to American battleships. Being a mid-tier battleship, her dispersion is still somewhat high at longer range. This can be mitigated my installing Aiming System Modification 1. Turret traverse is rather sluggish. Kongo is — effectively — a battlecruiser and needs to be able to dictate the terms of the engagement as she does not have a lot of armor. Upgrading her Propulsion module is first priority. After this, pick up Hull (B) for the upgraded main battery shells and a little bit faster turret traverse. The Fire Control System module upgrade can be saved for last. Slot 1 provides players with the first option in choosing a desired role. Typically, Main Armaments Modification 1 ( ) is recommended to provide additional survivability to the main battery, but players who desire to specialize in the secondary or anti-aircraft armament should choose Auxiliary Armaments Modification 1 ( ). Slot 3 allows for further specialization. Generally, Aiming Systems Modification 1 ( ) is recommended because it reduces shell dispersion of the main and secondary armaments. To increase the effectiveness of the anti-aircraft armament, mount AA Guns Modification 1 ( ). Players wishing to specialize for secondaries should mount Secondary Battery Modification 2 ( ). Spending credits or doubloons on Damage Control Party II ( ) and Repair Party II ( ) are recommended to maximize survivability. As with all battleships, Kongo comes with 8 signal flag slots. The three most important flags are India Delta ( ), Juliet Yankee Bissotwo ( ) and India Yankee ( ), all of which will improve your survivability. Captains wishing to improve the performance of their secondary battery should consider the addition of Mike Yankee Soxisix ( ). The Kongō-class battlecruiser (金剛型巡洋戦艦 Kongō-gata jun'yōsenkan) was a class of four battlecruisers built for the Imperial Japanese Navy (IJN) immediately before World War I. Designed by British naval architect George Thurston, the lead ship of the class, constructed in the UK by Vickers, was the last Japanese capital ship constructed outside Japan. 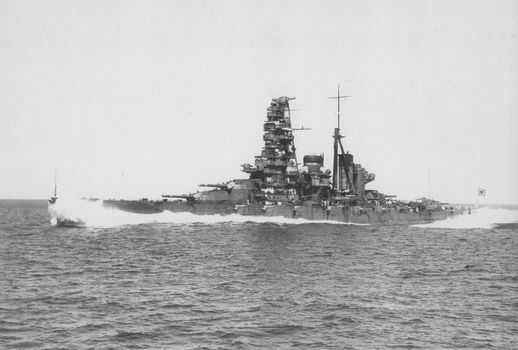 The Kongō-class battleships were the most active capital ships of the Japanese Navy during World War II, participating in most major engagements of the war. Kongō (金剛, "Indestructible", named for Mount Kongō) was a warship of the Imperial Japanese Navy during World War I and World War II. She was the first battlecruiser of the Kongō class, among the most heavily armed ships in any navy when built, and the last capital ship to be built outside Japan. Her designer was the British naval engineer George Thurston, and she was laid down in 1911 at Barrow-in-Furness in Britain by Vickers Shipbuilding Company. Kongō was the last Japanese capital ship constructed outside Japan. She was formally commissioned in 1913, and patrolled off the Chinese coast during World War I.
Kongō underwent two major reconstructions. Beginning in 1929, the Imperial Japanese Navy rebuilt her as a battleship, strengthening her armor and improving her speed and power capabilities. In 1935, her superstructure was completely rebuilt, her speed was increased, and she was equipped with launch catapults for floatplanes. Now fast enough to accompany Japan's growing carrier fleet, Kongō was reclassified as a fast battleship. During the Second Sino-Japanese War, Kongō operated off the coast of mainland China before being redeployed to the Third Battleship Division in 1941. In 1942, she sailed as part of the Southern Force in preparation for the Battle of Singapore. Kongō fought in a large number of major naval actions of the Pacific War during World War II. She covered the Japanese Army's amphibious landings in British Malaya (part of present-day Malaysia) and the Dutch East Indies (now Indonesia) in 1942, before engaging American forces at the Battle of Midway and during the Guadalcanal Campaign. Throughout 1943, Kongō primarily remained at Truk Lagoon in the Caroline Islands, Kure Naval Base (near Hiroshima), Sasebo Naval Base (near Nagasaki), and Lingga Roads, and deployed several times in response to American aircraft carrier air raids on Japanese island bases scattered across the Pacific. The Kongō participated in the Battle of the Philippine Sea and the Battle of Leyte Gulf in 1944 (October 22–23), engaging and sinking American vessels in the latter. Kongō was torpedoed and sunk by the submarine USS Sealion while transiting the Formosa Strait on 21 November 1944. She was the only Japanese battleship sunk by submarine in the Second World War, and the last battleship sunk by submarine in history. The ship modeled in the game is actually based off Hiei, the second ship of the Kongō class with a history that differed significantly from the her other three sisters. Unlike her other sisters, she did not undergo the first modernization that strengthened their armor and underwater protection, and was disarmed in 1930 to comply with the terms of the First London Naval Treaty. When Japan withdrew from the terms of the Second London Naval Treaty, along with the second modernizations of her sisters, Hiei underwent extensive modernizations to bring her up to their specifications. Fitted onto her was a pagoda style mast that differed from the other Kongō sisters, serving as the prototype of the superstructure that was later fitted onto the Yamato class. This is the superstructure that is featured by the in-game model. The in-game model is actually based on Hiei. Kongo had six twin 127 mm dual-purpose guns fitted to her midsection; the in-game model has only four. By July 1944, Kongo had 18 triple and six twin 25 mm/60 Type96 anti-aircraft guns, augmented by several more 25 mm guns in single mounts (see Historical Gallery). Kongo’s original battlecruiser configuration is missing. It was removed in a previous update. Kongō following her first reconstruction. Hiei in 1933, as a training ship. A diagram of Hiei as she appeared in 1942, showing her superstructure which differs significantly from her sisters. A diagram of Kongo as she appeared in 1944, showing her late-war enhanced AA protection and reduced casemate guns. This page was last modified on 23 March 2019, at 19:23. This page has been accessed 94,362 times.